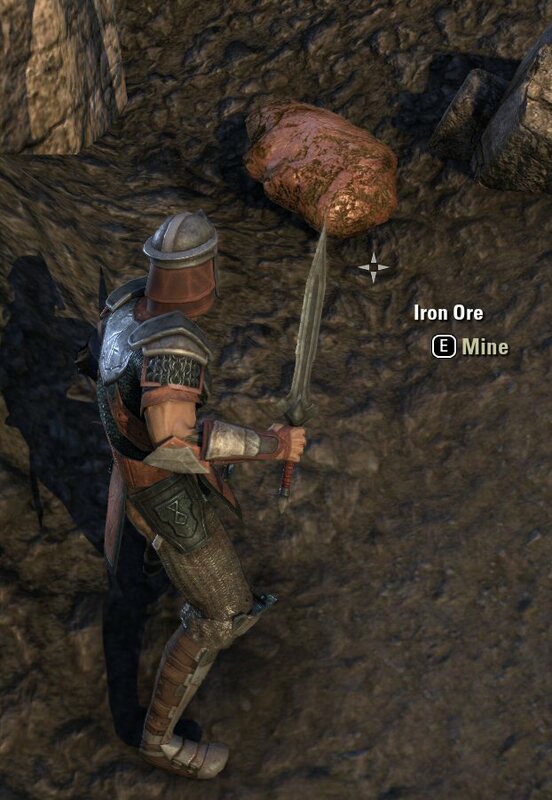 I've been seeing a bit of whining here and there about how resource-gathering is "hard" in ESO so I thought it'd be interesting to write a quick guide on it. This is by no means meant to be definitive but should get brand new players over the hump of "This is what you should look for." at least. First rule of resource-gathering in ESO is get off the freakin' road! See that part of the map that's well away from all the in-game markers, the part that has the impassable-looking terrain on it, the part that seems the furthest away from anything at all? Go there. Second rule of resource-gathering in ESO is to go to the edges and to go high up. The higher you are, the more likely you're going to see interesting things. The closer to the edges of things you are, the more likely you're going to see a little notch that nobody else is going to notice that goes straight to somewhere interesting. Third rule of resource-gathering in ESO is to use your eyes! Look around the terrain around you. Those people on horseback riding around the countryside at breakneck speed are not gonna see a thing and wouldn't notice a big pile of gold if they rode right past it (and they often do!). Stay on your feet, stay mobile, move your eyes back and forth sweeping the terrain around you. It doesn't much matter if you use first-person or third-person view, though I find the third-person view useful. This is iron ore. It's used to make heavy armor and most melee weapons. You'll pick up 3-4 units of ore for each of these you find. Iron ore is often tucked up against the sides of mountains, particularly the sides of mountains on coastlines. In some areas you can quickly run across three or four of these in a line tucked up against some distant mountain facing the coastline. This is wood. It's used to make bows, staffs, and shields. It tends to be in the same sorts of places you find iron ore, though big clumps of trees will often have at least one of these nearby if you hunt around a bit. These are the easiest to spot if you get high up and sweep your gaze around the nearby countryside. This is jute. It's used to make light armor. Conversely to wood, it tends to be the trickiest to find, often tucked in among other plant life (as it is here) or in the shadows of hillsides. I've also frequently found it on the outside edges of the towns that you visit. 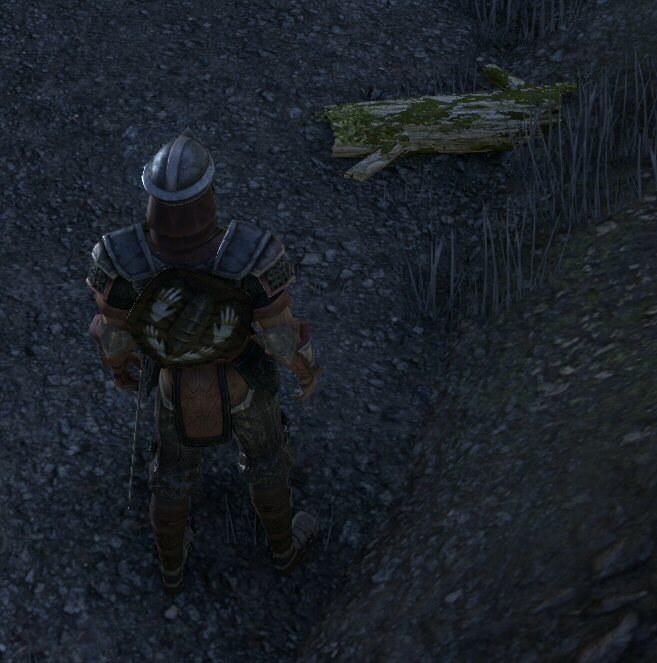 Not shown is the various hides used to make medium armor. You'll find these on the mid-level creatures inhabiting each area you visit: mudcrabs, wolves, ketches, bears, et cetera. This is a rune. There are three types. These are taken to Enchanting Tables in the crafting areas of the game and are combined -- one circle rune, one square rune, and one pentagon rune -- into glyphs. Once you have a glyph, you right click a weapon or armor or whatever to apply the glyph to it. Be wary of enchanting your bread-and-butter weapon since magical weapons eat through their energy stockpile and must be recharged with soul gems. This is a reagent, used to make potions. There are dozens of types. As you wander the wilderness, look for plants that look slightly out of place compared to their surroundings. 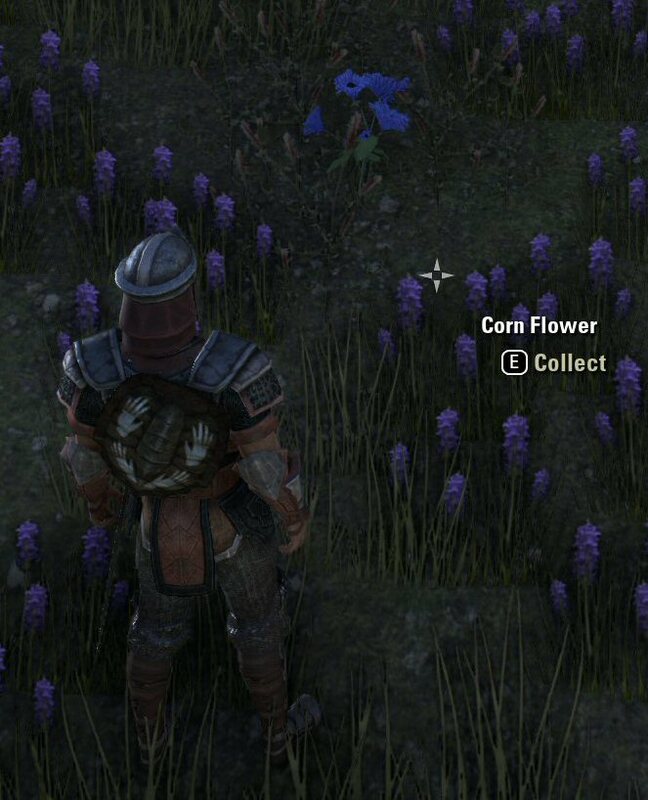 Note these blue flowers in the sea of purple. That's your clue that this plant is harvestable. I'm still learning about potion creation but it appears to follow the Skyrim model. This is a chest. It's the most rare type of resource that can be gathered. 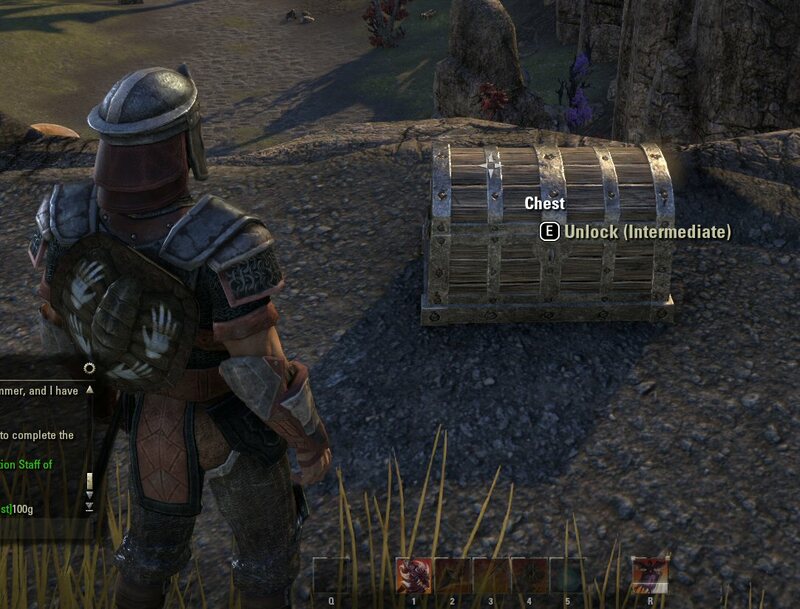 They'll be locked, and will use the ESO lock-picking mini-game to open. Chests are nearly always tucked away in remote corners of the map, behind notches along mountain walls, on remote beaches far from other players, or under bridges or other terrain features. Note this one placed on a cliff overlooking a road on which there were a lot of people completely oblivious to its presence. Chests always have a good stock of gold, a potion of some sort, and some sort of magical goody in them. They're almost never guarded. Finally, when you "win" a particular area and there are a lot of NPCs standing around cheering you, it will be tempting to go straight to the next area. Don't! That's what all the other morons are doing. All those resources that are usually on the map are still there in this "victory instance." Take ten or fifteen minutes and roam around looking for them. If your backpack isn't completely full of goodies before you enter the next area, you're doing something wrong. Other than chests, resources take only seconds to gather and once they're gathered, they disappear for other players for a goodly long stretch. So if you see one, pounce on it! Good advice. I also find it fairly easy to find resources by paying attention to colour. It sounds obvious and simple but by actively concentrating on the colours I need, I can end up with full bags after only a very brief duration (having to bank your stuff every 3 quests or so can get annoying, though.) For example, even the iron ore nodes (in my opinion the most difficult to spot, as they're mostly dull) can be spotted pretty easily if you pause for a half second on anything brown with a slight flash to it. Maple is ridiculously easy, and jute practically glows. Runes literally glow. Also, don't underestimate hirelings. Sure they cost skillpoints, but the materials they give you each day can be extremely good. Why wait 3hrs twiddling your thumbs for a spaceship fleet which never forms because the foe don't defend the timers? Go on a roam for 2hrs never getting a gudfight when all dock up? Gate camp and no one comes through? Train for a month for a skill which suddenly becomes (next to) redundant in the next patch? Time to turn off the computer, the market orders sell afk. Skills train in absentia. I found a book with real paper - they still make those. A themepark MMO generally has no working economy since resources aren't removed from the system. As you increase in levels your rewards increase in turn. It makes little sense to focus on resources at low levels, which will ultimately be worthless later on. All of this is painfully obvious to anyone that has spent more than an hour playing WoW. If it follows the Skyrim model, the loot you find is usually worse than what you can make for yourself. You learn enchantments by destroying found items, then learn to add those enchantments to items you find yourself. For an online game I would expect that more powerful items to use more building materials . Xmas is right in all particulars: you fairly constantly want to fill in gaps in your armor and weapons with stuff you make yourself. And the chests are quite rewarding, either as stuff to actually wear or as stuff to research. It's very much the Skyrim model. You'll actually be better off scrambling to level 10 as quickly as possible, then queueing up for Cyrodiil. The bags of stuff you get awarded for simply participating in fights are far more valuable to crafters than the materials you'll farm in your low level zone in the same amount of time. As for where to find resources? If you're Ebonheart Pact simply go through the starter quests and farm the heck out of Bal Foyen. Just ride around the outsides of the farms, farming resources. Because that's what farms are for. You'll find chests right out in the open where the incompetent Daggerfall Covenant NPCs are camping. It's also vitally important to note that the best way to level your crafting skills is to deconstruct items made by another player. Deconstructing your own stuff is less useful than building your own stuff, which is less useful than deconstructing found items, which is less useful than deconstructing another player's product. The difference between deconstructing your items versus another player's items is about double. You will need low level resources to level your crafting, since you can't even invest in the skills to use the higher level resources until you've built a few hundred items and deconstructed the hundred items your friend built. And then it's only after you've levelled your crafting a while that you get the skills to become more efficient at deconstructing. So power through to level 10. Get into Cyrodiil. While queued for Cyrodiil, spend some time looking for resources or questing. Make sure you move to a higher level zone when you graduate to new materials. Thus deconstructing a world drop green is better for you than a player created item. This is why I emphasise cyrodiil: just getting involved in a fight by shooting someone with a staff (who later dies) you get a mail containing a bag which will have a bunch of things like a random green item, perhaps an enchantment, and a couple of white item. A short visit to Cyrodiil (say, half an hour) can result in you receiving two or three bags. This visit to Cyrodiil will net you more XP, and material than wandering around the world for half an hour collecting resources on your own. For Alchemy, you really want Keen Eye passive, it makes it so easier (Columbine I'm looking at you) especially in the night. Also alchemy rocks the moment you get Laboratory Use... The pots are sick (HP+hot/MP+mot/spellcrit for 10s all in one bottle), so are the food buffs. Since you got there first I look forward to your Alchemy guide with a list of all the reagents! 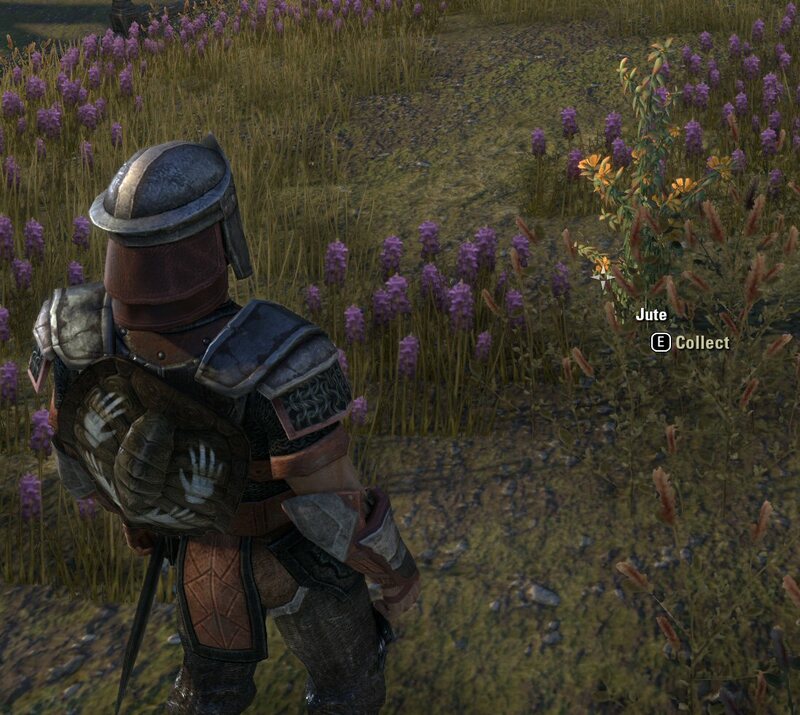 Nirnroot and Water Hyacinth are found near waterways. The mushroom types are found around big plants (e.g. : the mushrooms in Stonefalls, the trees in Bal Foyen). so ... basically play it like its skyrim and obsessively explore everything? This is certainly the best way to enjoy the game. Listen to the NPCs talking. Listen to all the quest text. Look around when you're out questing. Look behind those rocks. If you are mad keen to level your crafting as fast as possible, you will have to skip some of the fun parts. Confirm. The game definitely rewards a leisurely style. There are dozens and dozens of easter eggs. When the game is brand new, it makes perfect sense to harvest low level materials. The market isn't saturated yet. Also, themeparks DO remove resources, just at a slower rate than a full-economy game like EVE does. There's also the fact that people need those resources to craft, and they need to craft to get better at crafting. This sort of "it's insane, themepark, RARRR!" thought process is why so little of the MMO community has any business having an opinion on game design. We'd get better games if the vast majority of the community simply kept their mouths shut and played what they were given. It's a good thing that it's "hard" to find reources in TESO and it encourages getting off into the nooks and crannies. That's just the sort of thing that makes it Elder Scrolls and it helps slow down the rate of resource acquisition and devaluation. This game isn't as "themepark" as it initially appears. Actually Alchemy is different than most MMOs...the basic reagents are the same...they don't vary by zone. You'll see the same ones from 1-50. The solvent or water does vary but even low level gathering mats are used at end game. As far as hard...Aspect Runes...maybe. Chest haven't seemed that difficult, just watch when someone else finds one and wait...they'll usually leave it intack. Just move away and enjoy some space....even if you have to use a shrine to go to a new area, the zones just aren't that big. Level 50 will always be there and waiting. definitely buddy up or use an alt to craft / deconstruct...way faster. I've found that the reagents do vary by zone, but not by level of a zone. That is to say that you will find "Luminous Russla" near mushrooms and large trees. If the zone doesn't have such elements, you won't find Luminous Russla. I can't recall finding mushrooms in Stros M'Kai for example, while there are plenty in the mushroomy parts of Stonefalls. I'm fairly certain that one of the mushrooms (Emetic Russla? Namira's Rot?) 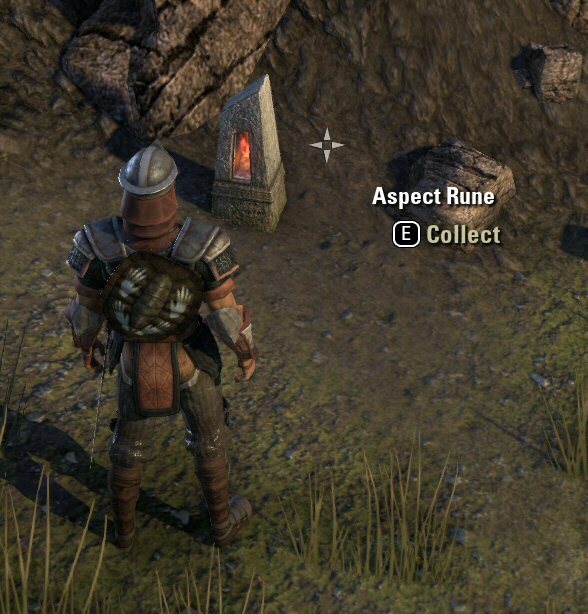 is only available in higher level areas: you won't find it in the starter zones or the level 10 zone but you'll stumble across it everywhere in Cyrodiil. Other reagents like Mountain Flower and Blessed Thistle are fairly common amongst all zones. It's certainly worth recording which way shrine is closest when you gather reagents. Fun, addictive game that has a lot of potential needed. Thanks for this Mini-Guide for Gathering.. it really helps. I’m having difficult in finding ores, jute and flowers when playing. They isn’t easy to recognize specially when leveling.. I’m pretty excited about the ESO Killer Guides to be available soon.. let see if the guide works or not. I’ve used their Eve Isk Guides before and it works for me, I’m confident that this will work too because if not I will take a refund.